Giovanni Maria Trabaci lived from 1575 to 1647. A highly prolific composer, he left a vast oeuvre of vocal and instrumental music. His works for keyboard are especially important: his bold, forward looking style, full of daring chromaticisms and unexpected harmonic turns, have paved the way for Frescobaldi and others. 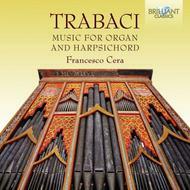 Francesco Cera plays a selection of Ricercares, Canzonas and Capriccii on these 2 new CDs. Cera is the ideal advocate of this highly original music: he knows the style inside out, and has the right dramatic approach, using a magnificent harpsichord built by Roberto Livi, as well as the historic organ built in 1570, in the Church of Sant�Antonio, Salandra, Italy. The booklet contains interesting information on the instruments, liner notes and the artist biography.